June 1. That’s the date Kikkan Randall’s had in her head for a while now, and it has nothing to do with a milestone or a checkup involving her first child. That’s when she’s getting back at it. 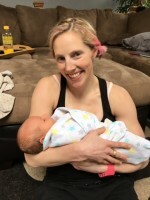 “I know I’m not going to be able to jump right in cold turkey to what I’ve been doing in the past so it’s going to be a gradual build,” Randall said on the phone from Anchorage, Alaska, earlier this month, about three and a half weeks after baby Breck was born. Normally when she’s home for the summer, Randall, a four-time Olympian and three-time overall Sprint World Cup champion, trains with her team, Alaska Pacific University (APU), about four times a week. The rest of the week she trains solo or in small groups, and this summer, she plans to do a little of all of the above. With her coach, Randall has formulated a plan that works for her, her husband, Jeff Ellis, and most of all, Breck. For the coming 2016/2017 race season, the 33-year-old Randall, who has been competing at the sport’s highest level since she was 19, plans to spend the entire winter in Europe on the World Cup circuit. That will involve traveling with Breck, her parents and in-laws at times, and eventually an au pair. Jeff will be there, too, as he works for the International Ski Federation (FIS) Cross Country marketing support. “We’re going to rely on our parents a little bit, they’re going to come over in intervals on certain weekends and periods and then there’s going to be a point in the middle of the season where we’d like to find a European-based nanny to help out,” Randall said. With the challenges of coordinating caregivers comes the cost of traveling with at least one extra person, like a nanny, on the circuit. While Randall retained her spot on the U.S. Ski Team’s A-team based on her FIS world ranking and Red Group status from two seasons ago and could potentially have much of her room-and-board costs covered by FIS, she anticipated the need to make different arrangements. “While I want to be as much a part of the team as I can, I don’t want to be disruptive and I think living in a hotel room with a baby for a whole year would be challenging,” she said. For the holiday break in late December, Randall and her husband reserved a condo in Davos, Switzerland, for a more-homey alternative and they are hoping to find a similar setup in Sweden before World Championships in Lahti, Finland. On April 14, after 13 1/2 hours of labor, Randall gave birth to her son, Breck Stuart Randall Ellis. The gender was a surprise, but they had a boy name ready. A few years ago, Jeff did a mountain-bike race called the Breck Epic in Breckenridge, Colo.
Breck’s middle name, Stuart, is his grandfather’s first name, dad’s middle name and great grandmother’s maiden name. “It relates back to a royal clan in Scotland, apparently, so that’s got some fun family history,” Randall said. His second middle name is Randall, and Ellis is his last name. So what’s harder — the hardest ski race she’s ever done or giving birth? It eventually did end and Breck, 8 pounds, 11 ounces, was born. Within two weeks he was back up and slightly heavier than his birthweight — thriving in his new world — and in the 90th percentile for length and 60th for weight. Now a month-and-a-half old, he’s up to 11 pounds and out of the newborn outfits and diapers. So far, she’s done some easy rollerskiing and biking the last three weeks, in addition to walking and “testing the waters” with the SkiErg. Regardless of how anxious she is, Randall asked the doctor to give it to her straight and what the most conservative approach is to returning to physical activity. 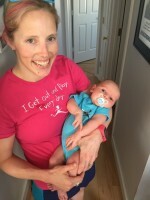 Three months after having her first child, Norwegian legend Marit Bjørgen injured her hip while jogging in March, having previously completed a 42-kilometer ski race. She and Randall have exchanged some text messages in the time since. In terms of goals, Randall’s focused on getting in shape for the U.S. Ski Team (USST) camp in Anchorage in mid-July. She figured that would give her six weeks of training beforehand. That Eagle Glacier camp will likely be her first time on snow. Beyond that, she plans to spend most of her summer and fall at home, with the exception of the USST October camp in Park City, Utah, and a trip north of Toronto to visit Jeff’s parents. Asked if she’ll take Breck along for some workouts (i.e. 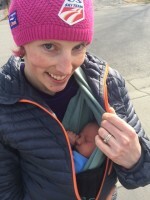 in one of her two Thule jogging strollers or in a front or back pack), Randall said she’d like to. Come fall, she plans to start the season in Europe with the rest of the team on the World Cup in late November. Her goal is to be in top shape by February for World Championships. “Other than that it’s going to be a lot of playing it by ear and seeing how my body responds to things,” she said. After a year off and now a mother, will she be the same racer? Randall said she’s not sure. Her friend and fellow Olympian James Southam told her that having a child gave him new motivation to do his best and set a good example. Randall’s not alone. Several other top World Cup women have also had their first children in the last year, including Finland’s Aino-Kaisa Saarinen (in early May), Slovenia’s Katja Višnar (last November) and Bjørgen (in December). FIS has taken notice and is initiating new rules that give caregivers (i.e. a nanny) World Cup accommodation travel rates and access to venues, according to Randall. FIS Cross-Country Event Coordinator Sandra Spitz said she could not comment on the changes until after the FIS Congress in early June. She’s hoping this group of women, all of which plan to continue competing, can prompt change and show that one can continue with their career after starting a family, rather than have to chose one over the other. As she held Breck in her arms, he cooed and grunted; she laughed and reviewed the last few weeks. “I don’t think I could’ve imagined just how happy and content I would be,” she said of motherhood. “When he’s just as cute as can be cuddled up, sleeping on my shoulder or when he’s just spit up for the third time and we’ve had to change his outfit and he’s spit up all over me, I seem to just really love every moment of it. And also how relaxed I’ve been able to be through it. I feel like I enjoy every moment and I’m just loving it.